Hilarious and profound. In 2001, while residing at Akademie Schloss Solitude in Stuttgart, artist and curator Octavian Esanu read hundreds of interviews and essays by artists and art critics. He then formed a new text out of questions about art, that he culled from his readings. Each question is duly footnoted. 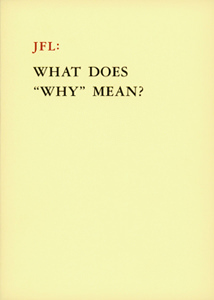 Originally published in 2002 in Germany by Edition Solitude, JFL: What Does "Why" Mean? is now available in North America, re-typeset and printed by J&L. Octavian Esanu is a Moldovan artist. JS: Jeanne Siegel, Multi-Media: Painting, Sculpture, Sound (panel with Lukin, Rauschenberg and Rivers on November 21, 1966), in Jeanne Siegel, Artwords: Discourse on the 60s and 70s, (De Capo Press, 1992), p. 151, LR: Larry Rivers, ibid., p. 165, RS: Robert Smithson, Four Conversations between Dennis Wheeler and Robert Smithson, (1969-1970), Edited and annotated by Eva Schmidt in Jack Flam, (ed. ), Robert Smithson, The Collected Writings, (Berkeley and Los Angeles, University of California Press, 1996), p. 214, PG: Philip Guston see Philip Guston Talking (1978), in Kristine Stiles and Peter Selz, (eds. ), Theories and Documents of Contemporary Art: a sourcebook of artists writings, (Berkeley, Los Angeles and London: University of California Press, 1996), p. 249, JS: Joan Simon, Breaking the Silence: An Interview with Bruce Nauman interview by Joan Simon, in Gabriele Detterer (ed. ), Art Recollection: Artists Interviews and Statements in the Nineties, (Florence: Danilo Montanari & Exit & Zona Archives Editori, 1997), p. 180, RI: Robert Irwin, Being and Circumstance: Notes Toward a Confidential Art (1985), in Kristine Stiles and Peter Selz, (eds. ), Theories and Documents of Contemporary Art: a sourcebook of artists writings, (Berkeley, Los Angeles and London: University of California Press, 1996), p. 573, NJ: Neil Jenney, Earth (1969), (Symposium at White Museum, Cornell University) in Jack Flam, (ed. ), Robert Smithson, The Collected Writings, (Berkeley and Los Angeles, University of California Press, 1996), p. 185, SL: Susan Lipper in Trip, see John Slyce Reading Susan Lippers Trip in Camera Austria, 72/2000, p. 44, YM: Yves Michaud, Joan Mitchell, Interview with Yves Michaud (1986), in Kristine Stiles and Peter Selz, (eds. 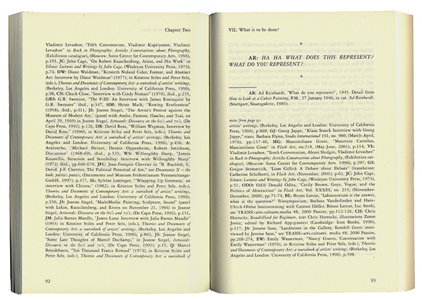 ), Theories and Documents of Contemporary Art: a sourcebook of artists writings, (Berkeley, Los Angeles and London: University of California Press, 1996), p. 33, AZ: Andrei Zhdanov, Speech to the Congress of Soviet Writers, 1934, in Charles Harrison & Paul Wood (eds. ), Art in Theory 1900-1990: an anthology of changing ideas, (Oxford, Malden: Blackwell Publishers Ltd. 1992), p. 409, Q: Question in An Introductory Conversation, Arthur C. Danto see L&B volume 11, p. 54, HC: Harry Cooper, On Über Jazz: Replaying Adorno with the Grain in OCTOBER no. 75, (Winter, 1996), p. 132, LB: Louise Bourgeois, Louise Bourgeois Interview with Donald Kuspit (1988) in Kristine Stiles and Peter Selz (eds. ), Theories and Documents of Contemporary Art: a sourcebook of artists writings, (Berkeley, Los Angeles and London: University of California Press, 1996), p. 41, PC: Paul Cobley, Semiotics for Beginners, by Paul Cobley, illustrated by Litza Jansz (Cambridge: Icon Books, 1997), p. 148.